Independence Aluminum 40 S&W Ammo 180 Grain Full Metal Jacket ammo for sale online at cheap discount prices with free shipping available on bulk 40 Auto ammunition only at our online store TargetSportsUSA.com. Target Sports USA carries the entire line of Independence ammunition for sale online with free shipping on bulk ammo including this Independence 40 S&W Ammo 180 Grain Full Metal Jacket. 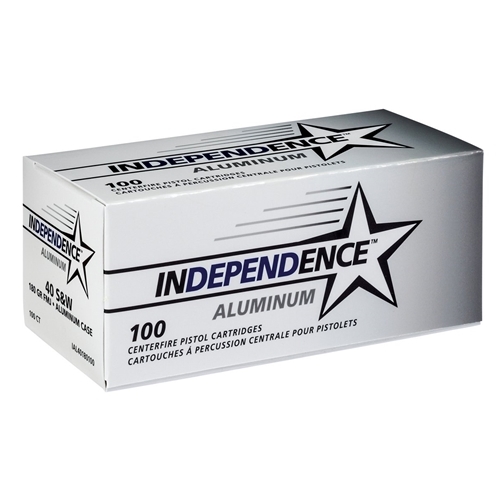 Independence Aluminum 40 S&W Ammo 180 Grain Full Metal Jacket review offers the following information; Independence ammo, part of the ATK Sporting Group's Ammunition group, provides small-caliber rounds to military, law enforcement and sport-shooting enthusiasts. 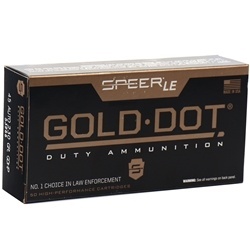 Quality ammo ideal for target practice and recreational shooting. Independence loads offer consistent performance at a very competitive price. ATK also operates the Lake City Ammo Plant, which makes millions of rounds for the United States military every year. This ammunition is perfect for target practice, range shooting, and tactical training; it’s both economical and reliable. ATK's ammo is all made here in the United States, with most components made under the same factory for enhanced quality control and consistency. This ammunition is a new production, non-corrosive, reloadable ammo in boxer primed and brass cases. 45 Ammo by Independence is packaged in boxes of 100 or cases of 1000. Independence 45 ACP AUTO ammo is brand new production that features a full metal jacket lead core full metal jacket bullet, a non corrosive primer. Independence 45 ACP AUTO ammo offers a muzzle velocity of 985 feet per second. Independence Aluminum 40 S&W Ammo makes great practice AMMO. No issues so far. Independence Ammunition, owned by the same company that owns Federal Ammo, CCI Ammo, Estate Ammo and otehrs ATK, contracted with IMI Israel Military Industries to manufacture 5.56x45mm ammo as well as some of the high demand calibers such as Independence 9mm ammo, 40 Cal ammo, and 45 ammo. IMI is Israel's government run military production facility tasked with producing ammunition for the Israeli army. IMI's ammunition is put to the test everyday in the hotbed of Mideast turmoil. The XM193 bullets sport a boat-tailed design for improved long-range accuracy and ballistics performance. This projectile has a lead core, copper jacket, and is non-magnetic. These rounds feature a water resistant lacquer applied to seal the primer and case mouth.